We Can Supply New & Second Hand Closed Circuit Rebreather From A Number Of Manufacturers. Let Us Know What You're After And We Can Ensure You Get The Right Product At The Right Price. Looking For Open Circuit Equipment? We Can Probably Help You Out With That Too. 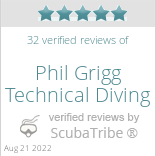 Phil Grigg Technical Diving offers a full range of Technical Diver Training & Technical Courses from Open Circuit courses for Nitrox and Trimix through to Closed Circuit Rebreather Courses. Our goal is to provide you with the quality of training needed to make you a safe and self sufficient technical diver. We can offer courses for all levels of technical diver training in both Open Circuit and Closed Circuit. We can also provide Side Mount training from entry level upwards. Interested in preparing gas mixes? We can train you in Nitrox Blending & Trimix Blending too. Check out the main equipment that we use, recommend and teach on. Read more about side mount configurations or research which rebreather model is best for you. We can supply, source or recommend suppliers of most equipment, Open or Closed Circuit. Did you know we offer FREE rebreather try dives at your pool or club night?